The transnational French car maker, Renault S.A has been selling cars in the Indian car market place ever since a few years now. Renault India has been doing quite well in the country’s automobile market and has some wonderful and reliable cars in their fleet. One such newly launched premium sedan from their stable is the 2012 R enault Scala Diesel RxZ , which is one of the top variants from their remarkable fleet of cars. Renault India is in alliance with Nissan India in the country and they share the same manufacturing facility as well. This manufacturing unit is based off Oragadam, which is located near the southern metropolitan city of Chennai. There are quite a few similarities in Renault Scala Diesel Sedan and Nissan Sunny as both these cars are being developed and made at the same factory. Renault Scala has been equipped with a power packed 1.5 litre petrol drive train , which generates a good amount of power and torque that is suitable for the Indian traffic conditions. This powerful drive train has been skillfully mated with a smooth and efficient five speed manual transmission gear box. This engine is quite fuel efficient as well and generates a healthy mileage, which is very important for the Indian populace. Renault India has bestowed this sedan with quite a number of striking safety and comfort features, which will certainly entice the buyers. Some of these brilliant features that are incorporated in the Renault Scala Petrol are rear AC vents for added comfort to the back seat passengers, a powerful and advanced music system with speakers and a few input options to enhance the in-cabin entertainment, multi functional steering wheel with mounted button controls to augment the drivers comfort. Apart from these comfort features, Renault India has also incorporated some very crucial safety features as well in this sedan to make it better for the Indian conditions. The company is said to be offering a 2 plus 2 year or 80,000 kilometers warranty along with their Renault Complete Care package to keep the after sales service and maintenance costs on the lower side. Overall, this Renault Scala Diesel RxZ is one of the best sedans in its segment and will be a tough competition to all its other competitors such as Skoda Rapid, Nissan Sunny, Hyundai Verna, Volkswagen Vento and also Honda City. This premium sedan is being offered in a couple of petrol as well as two diesel variants and this Renault Scala Diesel RxZ is the top end version in the diesel lineup. Taken as a whole, the exteriors of this premium sedan, Renault Scala Diesel RxZ has a very aerodynamic design. The front facade of this premium sedan gets a trimly styled chrome finish radiator grille, which is hexagonal is shape and also a central air dam below it. The front looks aggressive with a large emblem of the company embedded in the center along with some chrome treatment as well, which makes this sedan look polished. The head light cluster has elongated smoked styled head lamps that has a swept back look and have been fitted with high intensity double barreled lamps, which are surrounded by chrome and throw out radiant beams of light for enhanced visibility to the driver. The body colored dual tone front bumperhas been equipped with a pair of round shaped bright fog lamps, which further augments the vision of the driver in bad weather. The side profile is sleek and lustrous with chrome finished door handles and body colored outside rear view mirrors, which have been integrated with side turn blinkers. The pronounced wheel arches have been fitted with a classy set of 15 inch light alloy wheels of size 185/65 R15 , which have sturdy tubeless tyres with a strong road grip. The rear end gets a sleek and curvy boot lid with a chrome trunk garnish with “SCALA” embossed on it, which adds to the urbane look of this premium sedan. This boot lid also makes this, Renault Scala Diesel RxZ look wider and very spacious from the rear end. The tail lamp cluster is bright and clear with side turn indicator and reversing lights integrated in it. Overall, the Renault Scala Diesel RxZ has a very conspicuous and extraordinary design that will certainly be well liked by the Indian car enthusiasts. On the whole, this premium Scala petrol sedan is quite spacious and has ample leg room along with head and shoulder space. The total length of this sedan is about 4425mm along with an overall width of 1695mm, which includes the external wing mirrors. 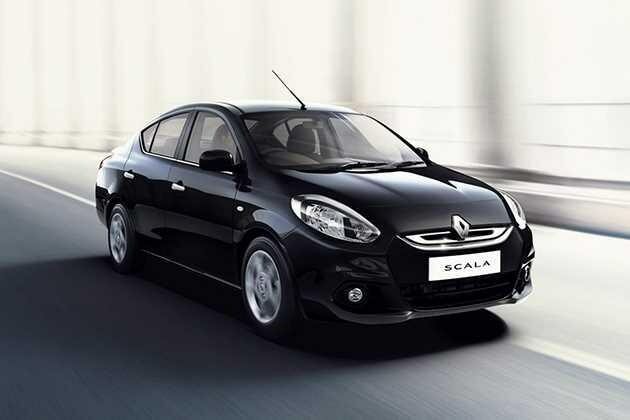 The total height of the Renault Scala is around 1505mm and it also has a roomy wheel base of 2600mm, which can easily accommodate five passengers inside it. The minimum ground clearance of this wonderful sedan is about 161mm and it has a huge boot space of 490 litres along with a centrally mounted fuel tank of 41 litres . The total kerb weight of this petrol sedan is in the range of 1080 kgs to 1085 kgs, while the minimum turning radius of this luxuriant sedan is just 5.3 meters. The interiors of this amazing sedan are extremely spacious with lots of room, which gives a very pleasurable driving comfort to all the passengers. The seats are plush with lavish and very comfortable cushioning and are covered with premium and high quality leather upholstery. The rear seat legroom is matchless and very comforting with a rear center arm rest to further augment the comfort. The interiors are done up very tastefully with an interior color harmony of dark grey, which gives the insides a very refined look. The internal surfaces are done up very neatly with good quality plastics, while the door trim finish is done up in fabric and the internal door handles are finished in chrome as well to add to the beauty of this Scala Diesel Sedan. The steering wheel as well as the gear shift lever and the hand brake are covered with high quality leather. The steering column is adjustable, while the internal day and night rear view mirror saves the driver from the high beams of heavy vehicles in the night. There is a multi information display, which displays quite a few things such as distance to empty, average consumption of fuel, tripmeter, instant consumption, external temperature and several other notifications and warning lamps as well, which give instant and latest information to the driver. There is quite a number of storage spaces as well like a large glove box, bottle holders in the front doors as well as the in between the front seats, a couple of cup holders on the rear center arm rest and so on, which further adds to the comfort level of the passengers. The sun visor’s of both the driver as well as the front side passenger gets a mirror with a flap as well. Apart from all these, there is a reading lamp along with a cabin as well as a trunk compartment lamp to help the passengers in the dark. This 2012 Renault Scala also has a digital clock as well as a 12V power outlet for charging phones or other accessories while travelling. This magnificent premium sedan, Renault Scala Diesel RxZ is housed with a power packed 1.5 L, 4 cylinders, K9K diesel power train, which has the capacity to displace 1461cc . This drive train can generate a peak power output of 84.28 Bhp at 3750 Rpm along with a maximum torque yield of 200 Nm at 2000 Rpm. This engine is mated with a smooth five speed manual gear box transmission and the company claims that this fuel efficient engine can generate a healthy mileage of close to 21 kmpl , when driven under standard driving conditions. The company has also fitted this top end variant with a start/stop button ignition, which will further enhance the fuel efficiency and give a better mileage. This premium sedan, Renault Scala Petrol has an efficient braking and suspension mechanism, while the front wheels get disc based brakes, the rear wheels get a drum based braking system . Apart from these efficient braking mechanisms, Renault Scala also gets an advanced antilock braking system with electronic brake force distribution and an emergency brake assist for further enhancing the brakes on any topography. The suspension system is one of the most important and vital feature of any automobile as it takes care of any sudden jerks and bumps to the passengers and ensures a smooth and effortless drive. The front axle of this long and majestic sedan, Renault Scala has been fitted with a McPherson Strut type of suspension , while the rear axle gets a torsion bar, which helps in keeping this massive sedan very stable and well balanced. Renault India has bestowed this top end variant, Renault Scala Diesel RxZ with some of the most highly developed and top of the line safety features. Their list includes dual front air bags for the driver and the front side passenger, ABS with EBD and emergency brake assist, speed sensing automatic door locks, an engine immobilizer along with a anti theft device that has an alarm as well, it has head restraints for all the seats that are adjustable, rear wind screen with a defogger that has a timer, whereas the driver side power window gets a one touch up and down function to add to the safety. All these along with many more such crucial features, which makes this sedan, one of the safest vehicles in the Indian car market. This latest entrant 2012 Renault Scala has been fitted with some of the most thrilling and practical comfort features, which will definitely tempt the buyers. To begin with, this sedan has a engine start/ stop button ignition with an illuminated button, a multi functional smart key that adds to the comfort, the advanced ‘Follow Me Home’ head lamps for added convenience, electrically foldable as well as internally power adjustable external rear view mirrors, a tilt adjustable electric power steering wheel that is very smooth and responsive and is also incorporated with mounted audio controls for added convenience for the driver, a powerful and very efficient air conditioning unit, which has an automatic climate control along with air quality control to keep the internal cabin fresh and rear comfort AC blowers for added comfort to the back seat passengers. The sophisticated music system with four speakers is quite good and has a Radio FM, CD player and also an Aux-in port . This premium sedan also has a manually adjustable driver’s seat, a clutch foot rest for resting the drivers foot during longer journeys , all four power windows, a rear defogger with timer, rear central arm rest with cup holders, a brilliant MID (multi information display) that has a number of notification lamps and other notifications along with a tachometer, a door open warning notification, a head lamp ‘ON’ reminder buzzer, key left reminder, external temperature display, a programmed service due reminder along with adjustable illumination on Meter, remotely operated boot lid, fuel cap as well as bonnet opener and many more such exciting and convenient utility functions, which will enhance the comfort level of this sedan. Stunning exteriors along with loaded interior features, a powerful engine with a good pickup and acceleration. Engine noise can be reduced, price can be more competitive and mileage can be improved as well.